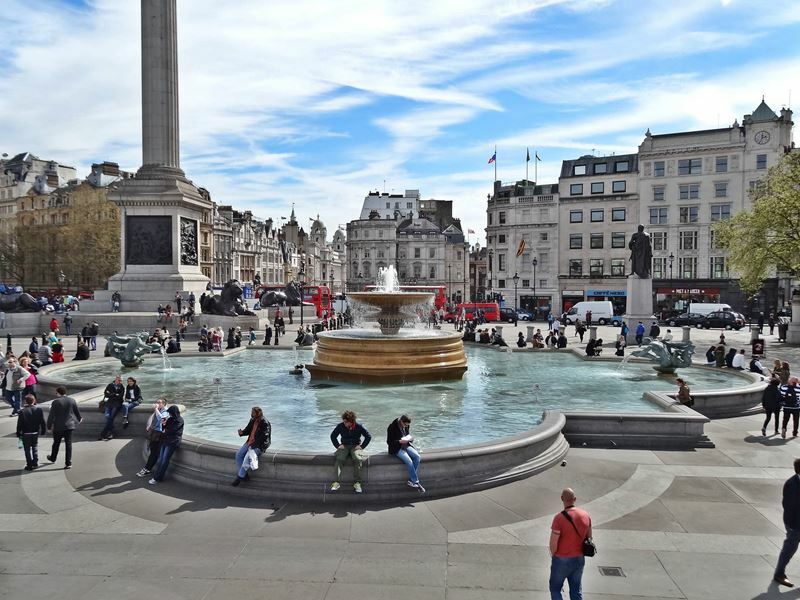 The Trafalgar Square is the perfect place for those who like to watch the goings-on in the city. Even if there are a lot of people, you will usually face a relaxed atmosphere in the late afternoon. Sit down at a fountain and let a day full of sightseeing impressions end in a pleasant way. 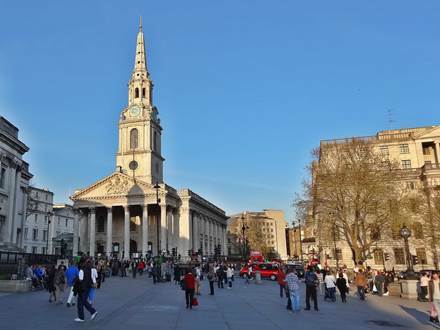 Due to the location and the size of the Trafalgar square, it is the preferred venue for major events in the city center of London. Among the most popular events is the Christmas carol-singing, which usually takes place every day from around 10th to 20th December, and the St. Patrick's Day Festival in March, when the square is filled up with numerous stalls and a stage with free concerts. A link with current schedule is available at the end of this article. But even if you are not in London at one of the event dates, you will still have the chance to enjoy a free performance, because the place is very popular with many street artists. 1. 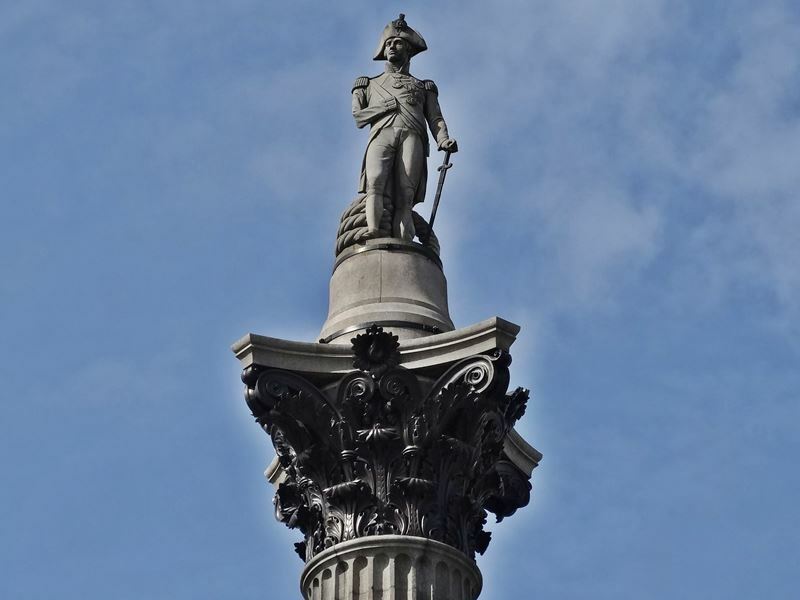 The Nelson's Column is the most famous monument at the square. The column with a statue at the top was built in the year 1842 in remembrance of the famous British war hero Admiral Lord Nelson. The final resting place of the admiral is situated in the nearby St. Paul's Cathedral. 2. 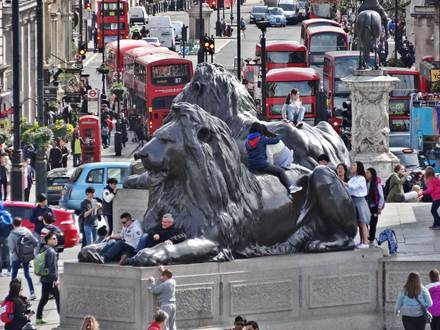 The bronze Lion Sculptures at the foot of Nelson's Column are a challenge for young and old. You have to climb a bit to reach a place in front of or on one of the lions. Exactly this is the appealing point for the popular photo scene. 3. 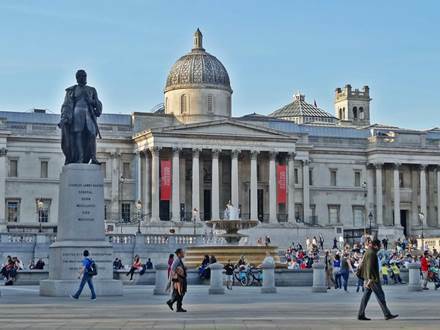 The National Gallery is the largest building on the square and particularly striking by the tall columns on the facade. 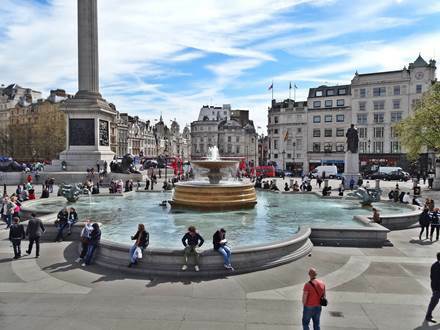 Some steps lead up to the area in front of the building, which offers a good overview of the Trafalgar Square. The entrance to the National Gallery, the famous London art museum, is free. 5. The two Fountains with the surrounding basins offer some good seat possibilities to observe the hustle and bustle at the place. On some hot days, which do not occur frequently, usually overheated tourists put their stressed feet into the water, although it is forbidden. 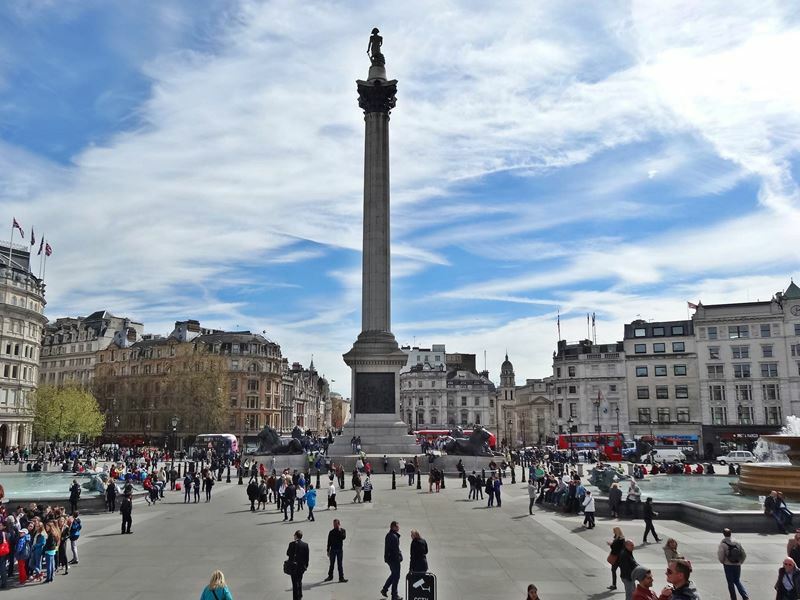 About 15 million tourists visit the Trafalgar Square every year. 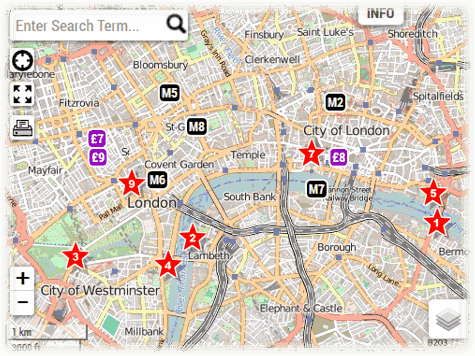 Thus it is among the 10 most visited tourist attractions in London. Officially, the square has an estimated capacity of up to 19,999 people at the same time.